See the entire collection on Topshop now for sale. Are you ready for fun spring makeup? I love this Spring Perk-Me-Up-Set from Benefit that comes with the three most popular products: ooh la lift for an instant eye lift, dandelion's fresh pink powder, and BADgal lash for your flirty lashes. All this for only $58 (A $65 value!). And guess what? From now until Tuesday, May 1st, Coquette readers will get FREE US Standard Shipping with the purchase of Spring Perk-Me-Up Set. Valid through May 1, 2007. Just enter SPBUNDLE at checkout. Order Here. Do your makeup while you check your email! This futuristic PC designed by architect Won-Chul Kim was shown at Samsung and Intel Korea's PC Design Contest 2007. 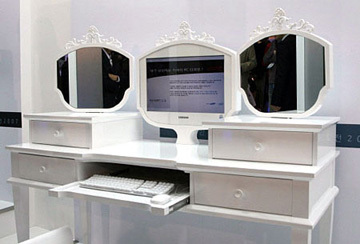 Not sure if this vanity workstation will take off but it's the perfect PC for beauty editors! The Hanes Comfortique shop opened for three days on Melrose Place a couple weeks ago to unveil the new Comfortique line of intimates hosted by Jennifer Love Hewitt. It was cool to see all the celebs that were there and that this new favorite comfortable bra that I love, love, love, getting it's time in the limelight. (See my previous post here.) Models were dressed by celebrity stylist Jennifer Rade strutted their stuff wearing sheer recreations of the latest spring runway looks layered atop Hanes intimate apparel. Although the shop was around for only three days, you can shop for your Hanes Comfortique Bra online! Tara Subkoff (right), actress and Imitation of Christ fashion designer chillin' out with the DJ. Supermodel turned actress Amber Valetta. I loved her in the 90's. See my previous post about her and Shalom here. Celeb stylist, Jen Rade with model, Lindsay Schoneweis from NBC’s “Deal or No Deal”. Jennifer Love Hewitt looking snazzy on the red carpet. Jennifer and the Hanes Comfortique Bra (so comfy!). Thank you FashionIQ! Little o' Coquette here has made their list for the Top 50 Fashion Blogs in the US. I'm at #33 and very happy about it all. Check out the full list to see some of our familiar web snob fashion friends, bookmark some new sites, and read FashionIQ's tips on how you can optimize your own blog for better readership and traffic. Pockets on dresses are popping up everywhere from cute mini's to evening gowns at the Oscars. (Remember Sandra Bullock last year?) But these pockets aren't for stashing your loose change or lipstick. They are there so you can put your hands in 'em and walk nonchalantly down the street and say, "Oh I'm just breezin' by in this little o' thing." Pictured above is one of my favorite pocket dresses, the Pocket Babydoll Dress by Chloe Dao and Diana Eng for the final Fall 2006 runway show for Project Runway Season 2. (Photo: NY Mag.) 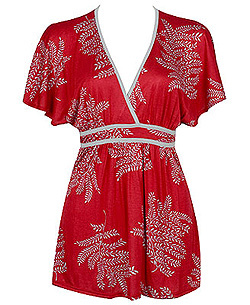 You can buy this dress in gold or pewter from Chloe's Lot 8 site for only $298. These new looks are being reinterpreted for cute summer dresses and are definitely worth your attention! There are lots of great colors available! 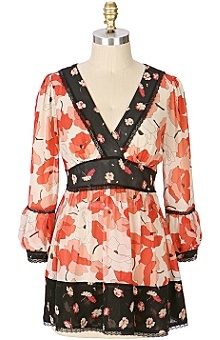 Kimono styles are in this spring for flirty tops or dresses. The sleek Phoebe Couture Kimono Dress ($250 at Neiman Marcus) looks fresh with it's mix of prints, but sophisticated for a stylish night on the town. Time for a Coffee Break!! Can we tawk ladies? To celebrate Administrative Professionals Week and Secretaries Day this Wednesday, Naughty Secretary Club has got it going on with her 5th annual sale where everything, yes EVERYTHING is 25% off. Jennifer Perkins, the former secretary turned jewelry designer, is the creative gal behind Naughty Secretary Club. 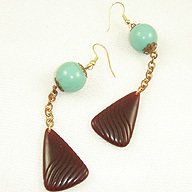 You'll look cool in her stylish earrings, brooches, necklaces, and more. She's has the cutest baubles to brighten up your dull work week and her accessories can also snazz you up for the perfect date night. She'll help make you the jeweled envy when you're out shopping with the gals on the weekend. 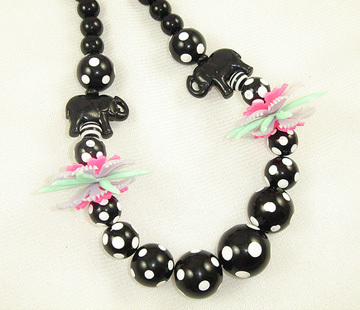 Pictured above is one of my favorites, Polka Dots and Pachyderms Necklace ($54) with fun black and white polka dot beads (polka dots are in, remember?) 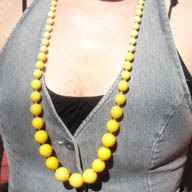 along with two vintage plastic elephant beads. So cute! 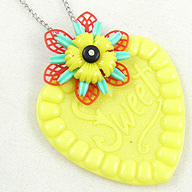 When not designing her cool jewelry at Naughty Secretary Club, Jen is also the crafty host of DIY network's Craft Lab. This fab lady can do it all! And guess what? It's time to treat yourself to a little shopping trip online by heading over to the Naughty Secretary Club. Everything is 25% off from now through Saturday, April 28th. Just enter 310004017 in the voucher field when you check out, hit refresh and see your discount. 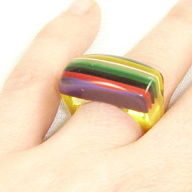 Shop in her Etsy store for crafty curios for 25% off too! Who doesn't love brown and pink together? 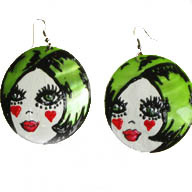 Handpainted shell earrings as an ode to Apple Martin, Gwyneth's baby. 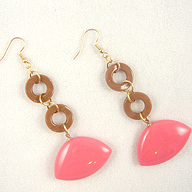 Perfect spring accessory! Pick from yellow, red, green, or purple. 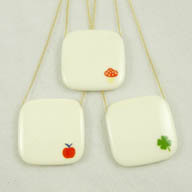 Cute mushroom, apple, or clover pendant on a thin 18" gold chain. Tiny buckles on these delicate mesh rings. 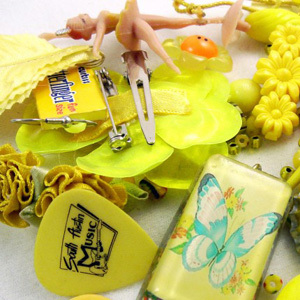 In this seasons "it" color yellow make up your own cute accessories! White shirts from top designers hit the Gap today! 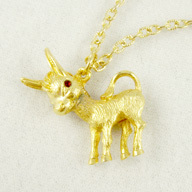 Girlawhirl can’t wait to check out the new designs from Doo.Ri, Rodarte and Thakoon. FabSugar has the best in basic and beautiful wedding hairstyles. SheFinds: Short Shorts: Hot or Not? I want candy! 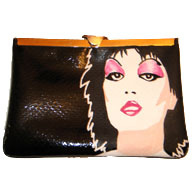 Fashiontribes finds some sweet bags, accessories & other fashion treats. Kristopher Dukes digs Cut-Out Wedge Jil Sander Shoes, 'cause a fresh spring double-oh-seven is all about lightening up. 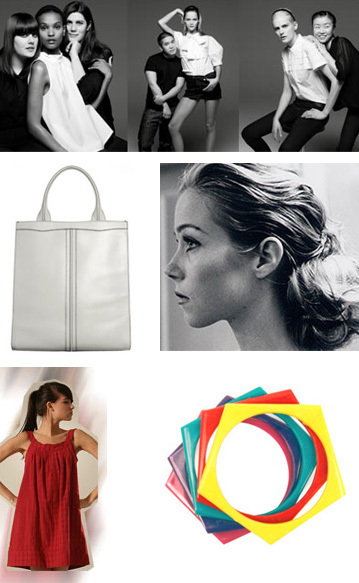 eBelle5 Celebrity Auction Alert: Scarlett Johansson's and Sheryl Crow’s Designer handbags are up for grabs. StyleBakery.com: Are you on the best dressed list? Find out which of this season's hottest dresses flatter your figure. The Jewelry Weblog wonders if yellow gold will ever be as popular for wedding bands as it was back in her day.